Singer, guitarist and songwriter, born 25 April 1923 in Indianola, Mississippi, died 21 December 1992 in Memphis, Tennessee. Like his peers B.B. 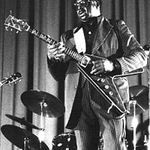 King and Freddie King -both unrelated-, Albert King is one of the most influential blues guitarists of the 1950s and 1960s. A recording artist since the late 1940s, he enjoyed his biggest commercial successes while signed to the Stax label from 1966 until 1974.